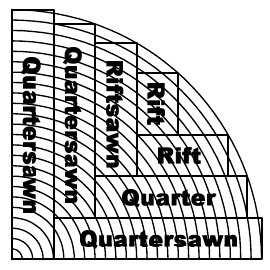 Have you heard the terms quartersawn, riftsawn and flatsawn and wondered what on earth they mean? Often, sawyers like myself struggle to define these terms among ourselves, let alone explain them to others. I am by no means an expert on the subject, but I have been working with and learning from sawyers for most of a decade now, and I feel like I’ve finally gotten a grasp on what these terms mean. In this blog post I’ll give some examples and definitions that work well for me as I’m sawing and that I use everyday when talking with customers. Let’s start with quartersawn. From the Merriam-Webster’s dictionary it is defined as, “Sawed from quartered logs so that the annual rings are nearly at right angles to the wide face." Right here we have a two part definition. It is a way of sawing a log (sawing the quarters of the log), and it is a grain orientation on a board (rings at 90 degrees to the wide face). Another term for the growth rings at 90 degrees to the wide face is Vertical Grain or VG. Where it gets confusing, is that even though these two words are often used interchangeably, not all boards from a quarter sawn log are vertical grain, and not all vertical grain boards come from quarter sawn logs. To explain this, I will need some pictures and diagrams. 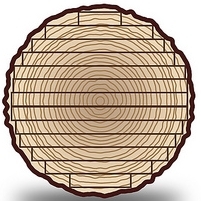 The above illustration shows how boards are cut out of a quarter of a log. 4 of the boards are labeled "quartersawn". The growth rings on these boards are oriented at an angle of between 60-90 degrees to the wide face. This is the most accepted definition within the industry. The 3 smallest boards are labeled riftsawn, and we will get to those in a minute. For those who want to explore this further, here is a cool animated video about the quartersawing process. The illustration above shows a "plainsawn" log, or one sawed “through and through”. You will notice that much of the lumber in the middle of the log has grain oriented at an angle of between 60-90 degrees to the wide face of the board. This would be classified as "quartered" or "vertical grain" yet it has most definitely not been quartersawn. This proves why it is important to understand whether the term used is referring to how the log was cut, or how the grain is oriented in the board. The latter is usually what is relevant to the wood user. It is only us sawmill geeks who are interested at all in the former. For the wood user, a quartersawn board will provide the benefits of both the sawing process and grain orientation. Vertical grain lumber is quite popular for both its appearance, as well as its strength properties. Oregon White Oak has what are called medullary rays that radiate out from the center of the log perpendicular to the growth rings. When quartersawn so that the vertical grain is showing, these rays are displayed for all to see. In addition to being aesthetically striking, vertical grain lumber has greater strength and stability, and is less prone to movement with changes in moisture. Next on our list is riftsawn. This is most commonly defined as a board with grain oriented at an angle of between 30-60 degrees to the wide face of the board. Since the grain is oriented at roughly 45 degrees to the tangent of the log, there is not really any practical way to "rift saw" a log. If you look at the diagram above, the riftsawn boards would be the 3rd and 4th board up from the bottom and the 3rd and 4th board down from the top. 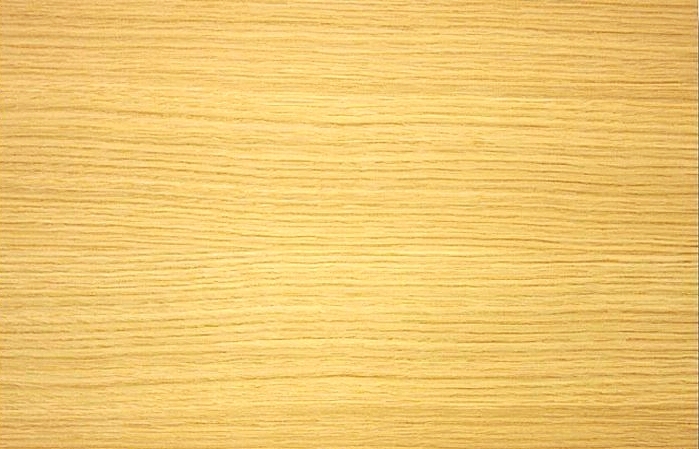 Riftsawn lumber is particular popular in oak because it is very uniform. The medullary rays are mostly hidden at this gain angle, and every board looks almost the same. It still has much of the dimensional stability of quartersawn. Last, but not least, is flat sawn. As you can tell from the diagram above, flatsawn boards have the grain running parallel with the wide face of the board. This creates a completely different look, as the saw effectively slices the annual growth rings right down the middle, giving what is known as a cathedral window look. Here you can see the cathedral look of the grain on a freshly sawn oak board. Flatsawn lumber tends to not be very stable. It wants to cup and bow during the drying process, and it also has a tendency to move more with changes in moisture. Flatsawn boards should not be confused with the term "plainsawn" which refers to a way of sawing a log. Plainsawing a log is when the log is simply sawn through and through without ever turning the log, as is shown in the diagram second from the top of this blog post. 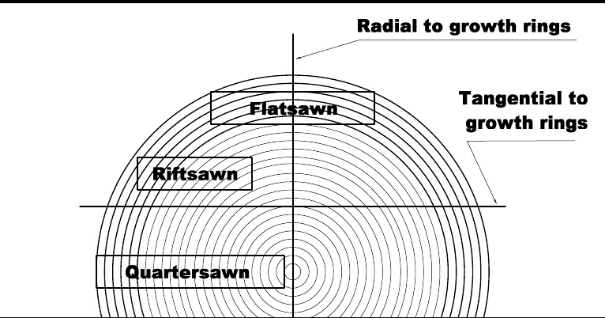 As one can tell from the diagram, plainsawing will yield a mixture of flat, rift, and quarter grain. It is possible to truly flat saw a log, by turning the log 90 degrees after every cut off of the face. This is more labor intensive, but less wasteful, and we often saw smaller lower grade logs this way. It is not practical to saw a log without getting boards of all three types. Luckily, there are great uses for all three types of boards. The wide and clear rift and quarter grain boards are most often used in furniture and cabinet projects. The narrower rift and quarter boards, as well as most of the flatsawn boards are great for flooring. The narrower the board, the less susceptible it is to movement. For this reason, we limit the width of our flooring boards to 4.25". At this width, even a perfectly flatsawn board that has been well dried will stay remarkably stable. As you can see in the photos of flooring on the product pages of this website, we incorporate all types of grain into our flooring, making for a beautiful and unique floor. The art of sawing quarter, rift and flat grain boards is one of the most creative and exciting parts of my job. It is amazing to see the variety of colors, patterns and grain configurations that can come out of a single log. Hopefully this clears up your questions about what these terms mean and how we are able to get so many different looks from our local hardwood resources. Please feel free to post a question in the comments section, if something is not clear.